In 2004, Haig and his partner Tamar decided they would like their wedding invitations to show their creative nature and a traditionally designed card just wouldn’t do. 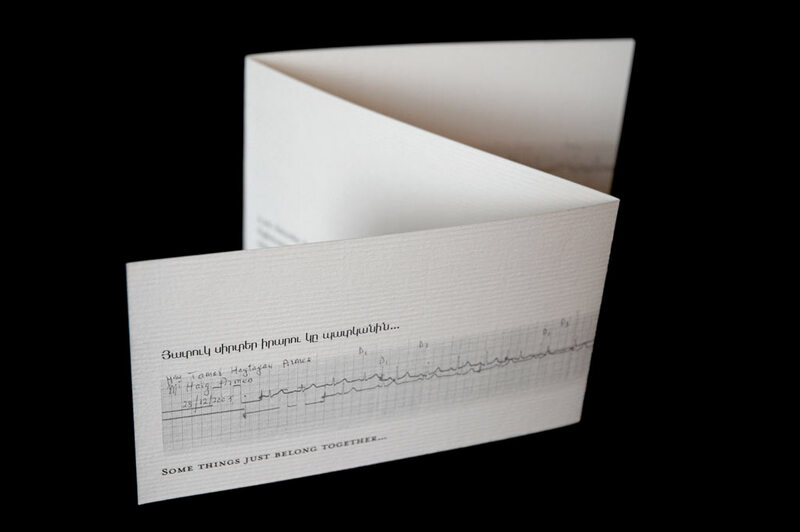 When designing the card, Haig remembered that a family friend who was a retired doctor had examined him and his soon-to-be wife with an old cardiogram machine. They were given two long grids with their heartbeats plotted out over time as souvenirs. Haig scanned and superimposed the two heartbeats and extended them over a long two-fold card. The heartbeats were accompanied by a minimal typographic treatment of both English and Armenian text. The wedding invitations continue to receive an overwhelming amount of positive feedback.